Eight to nine inches long. Scarlet-red crown and throat, white nape, black breast, pale-lemon sometimes speckled belly and black stripped wings and back. Some females have a black crown and a white throat. Inhabits mixed forests from southeast Alaska and the Yukon, to James Bay, to eastern Quebec almost to Newfoundland, and from Minnesota and Iowa to throughout the Appalachians up to Maine, New Brunswick and Nova Scotia. Winters in southeastern U.S.
Sapsuckers make systematic patterns of holes in trees and return to feed on insects attracted to sap dripping from these holes with its long bushy tongue. They also feed on insects that simply inhabit trees, and those it catches in aerial chases. Sapsuckers feed on sap from a wide range of trees, including alder, birch, maple, poplar, wild apple and many other fruit and ornamental trees. Occasionally they eat nuts, berries and other fruit, and the soft pulpy layer under the bark of fruit trees. Sometimes they eat slugs. They nest in deep tree cavities (as much as 18 – 20 inches) which they bore out at heights from just out of reach to twenty or thirty, sometimes over fifty feet high, often in live aspen and poplar or dead birch trees in woodlands with other deciduous trees (aspen, birch, poplar, willow, etc.) mixed with coniferous trees (spruce, fir, pines). Sometimes they nest in orchards and residential areas. The Sapsucker often excavates new cavities each season, often in the same tree as its last cavity. Females lay five or six, more or less, white eggs once per year which hatch after less than two weeks incubation and young leave the nest in about another four weeks, a relatively long brood season. 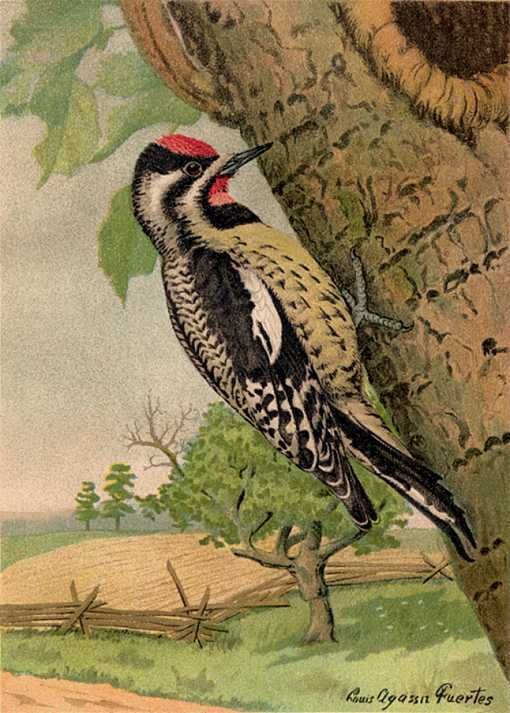 The Yellow-bellied Sapsucker Birdhouse has a 5″ by 5″ square base, 12″ floor to the ceiling with a 1.5″ inch diameter hole centered 10″ above the floor. Assemble with corrosion resistant screws fit to pre-drilled countersunk pilot holes to reduce wood splitting. Secure hinged roof with shutter hooks for easy access. Fill the box with wood chips, not sawdust. Install in woodland edges near clearings within the proximity of lowlands and water, from just out of reach to twenty feet. Installations at significant heights should be installed and maintained by professionals, carpenters, electricians, power line workers, etc. Other woodpeckers, fly catchers, even titmice and nuthatches also may use this nest box. 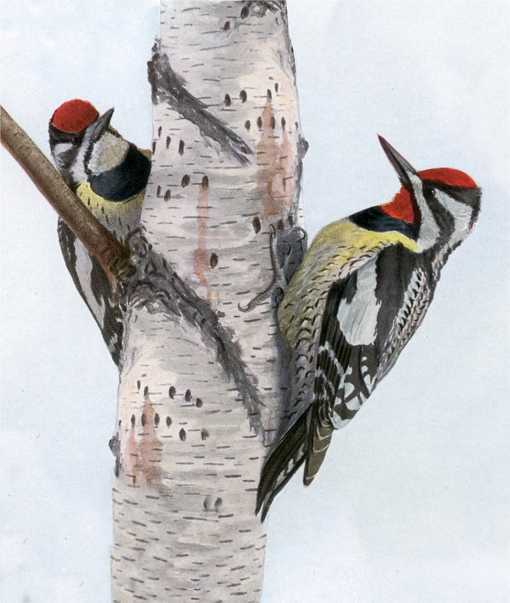 They nest in deep tree cavities (as much as 18 – 20 inches) which they bore out at heights from just out of reach to twenty or thirty, sometimes over fifty feet high, often in live aspen and poplar or dead birch trees in woodlands with other deciduous trees (aspen, birch, poplar, willow, etc.) mixed with coniferous trees (spruce, fir, pines). Sometimes they nest in orchards and residential areas.